Written reports can be enhanced with the aid of illustrations, tables, figures, and examples. These are situated in the text as long as they correspond logically to the matter in question, and are discussed accordingly. Research findings are placed as closely as possible to their first reference in the text. Individual research findings are not elaborated in the text, but rather the conclusions and generalisations drawn from the larger body of research. Tables and illustrations must be able to stand on their own in terms of understandability. Exceptionally large or extensive visual aids should be relegated to the appendices. Tables are especially appropriate for communicating numeric information. 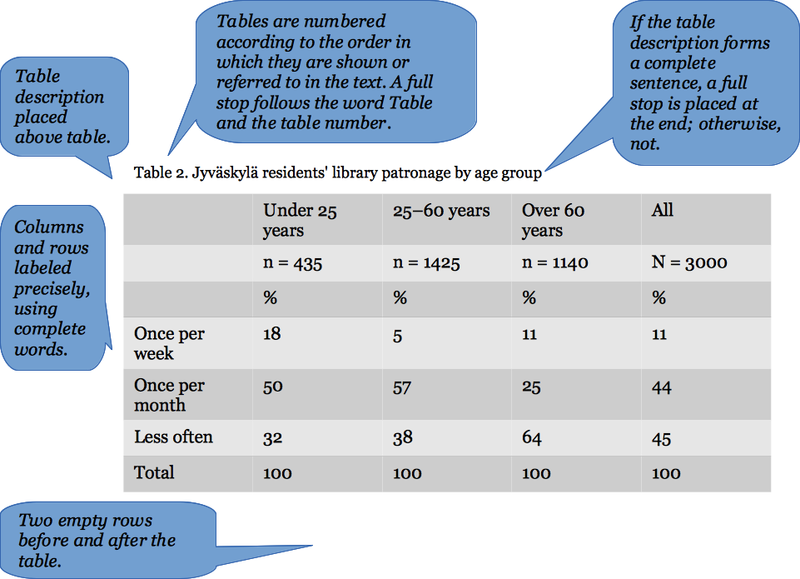 The description (or heading) above a table is expressed as Table, followed by the number of the table relative to its placement (or the first reference to it) in the text. It is subsequently referred to by this name (for example, Table 3). If a table is borrowed from another source, that source must be cited along with the description/heading of the table. A figure depicts information. All visual depictions of information, with the exception of tables, are figures. The purpose of a figure is to supplement the text or reduce the amount of it, rather than to simply reiterate concepts expressed in the text. A figure is, by its nature, more revealing than a table; therefore it suffices to place a description below the figure. The description of a figure is expressed as Figure, followed by the number of the figure relative to its placement (or the first reference to it) in the text. (See Figure 6.) N.b. When using borrowed figures and images, for example photographs, it is imperative to check for copyrights. Qualitative research findings are illustrated with samples of data in the form of, e.g. participants’ responses to interview questions. 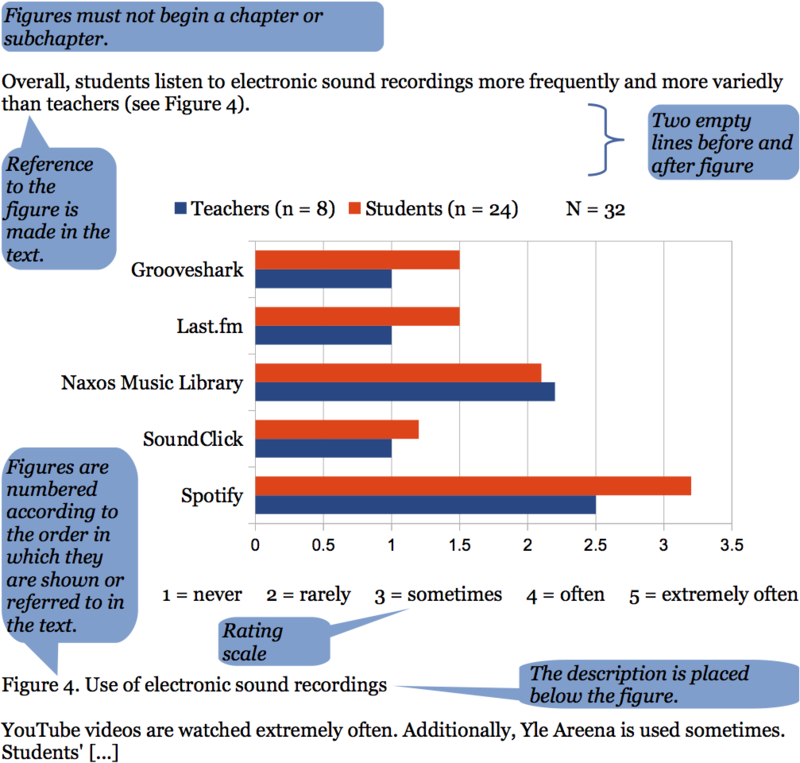 Data samples are chosen with the intention of illustrating objective, unbiased information about both the generalities of and the exceptions to various phenomena. The guidelines for indenting apply to blocks of text constituting quotations and verbatim responses. The following example is taken from Hendriks’ (2013, 34) bachelor’s thesis.